This tripod from the Travel Angel Series 1 will allow you to support up to 8kg. This compact tripod features reverse-folding legs which enable it to fold down to 43.94cm which makes it the ideal companion for travelling. When the 4 section twist-lock legs are fully extended, the FTA18CV0 reaches a maximum height of 154.5cm. Also, one of the legs of the tripod can be fully removed and connected to the centre column to create a monopod. The legs are made from 9-layer carbon fibre and weighs in at just 1.54kg. Rubber feet and stainless steel spikes let you use the tripod on a variety of surfaces such as grass, ice, or wooden and tile floors. The rapid centre column has a hook on the bottom so you can attach weights for more stabilisation. 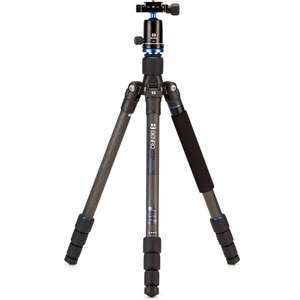 A V0E Ball Head is included with this Travel Angel Tripod Kit. It features seperate pan and ball locks and an Arca-type compatible clamp with a quick-release plate. A 90º notch allows you to quickly change your camera to portrait and an integrated buble level helps maintain alignment. The base of the head connects to the tripod via the 3/8"-16 thread and the included plate provides a 1/4"-20 camera mount.